Peptide KDSATNN*STEPWDGTTNESC, corresponding to amino acid residues 147-166 of human A2BAR with replacement of cysteine 154 (C154) with serine (*S) (Accession P29275). 2nd extracellular loop. Homology Rat - 14/19 amino acid residues identical; mouse - 13/19 amino acid residues identical. 1,3,5. Anti-Adenosine A2B Receptor (extracellular) Antibody (#AAR-003), (1:200). 2,4,6. Anti-Adenosine A2B Receptor (extracellular) Antibody, preincubated with the control peptide antigen. Immunohistochemical staining of rat lung paraffin embedded sections using Anti-Adenosine A2B Receptor (extracellular) Antibody (#AAR-003), (1:50). 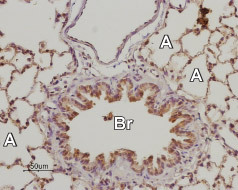 Staining is present in the respiratory epithelium of the bronchiole (Br) as well as in the pneumonocytes of the alveolar wall (alveoli, (A). Color reaction was obtained with SuperPicture HRP-conjugated polymer (Zymed) followed by DAB. Hematoxilin is used as the counterstain. Rat enterochromaffin (EC) cells (1:500), (Damen, R. et al. (2013) PLoS ONE 8, e62607.). Cell surface detection of Adenosine A2B Receptor in intact living rat pheochromocytoma PC12 cells. A. Extracellular staining of cells using Anti-Adenosine A2B Receptor (extracellular) Antibody (#AAR-003), (1:100) followed by goat anti-rabbit-AlexaFluor-594 secondary antibody. B. Merge of A and live view of the cells. Okusa, M.D. (2002) Am. J. Physiol. Renal Physiol. 282, F10. Fredholm, B.B. et al. (2001) Pharmacol. Rev. 53, 527. Nakata, H. (1989) J. Biol. Chem. 264, 16545. Baraldi, P.G. et al. (2006) Curr. Med. Chem. 13, 3467. Polosa, R. (2002) Eur. Respir. J. 20, 488. The adenosine A2 receptor subtype was subdivided according to affinity for adenosine; A2AAR has high affinity and A2BAR has low affinity. Anti-Adenosine A2B Receptor (extracellular) Antibody (#AAR-003) is a highly specific antibody directed against an extracellular epitope of human adenosine A2B receptor (A2BAR). The antibody can be used in western blot, immunohistochemistry, live cell imaging and indirect flow cytometry applications. It has been designed to recognize A2BAR from human, rat and mouse samples. Human ovarian cancer A1780 and HEY cell lysates. Sureechatchaiyan, P. et al. (2018) Purinergic Signal. 14, 395. Andres, R.M. et al. (2017) J. Invest. Dermatol. 137, 123. Densmore, J.C. et al. (2017) Exp. Lung Res. 43, 38. Rat retina cell lysate (1:1000). Vindeirinho, J. et al. (2013) PLoS ONE 8, e67499. Hayashi, M. et al. (2016) Eur. J. Physiol. 468, 1171. Lavoie, E.G. et al. (2017) Gene Expres. 17, 327. Benito-Munoz, M. et al. (2016) Glia 64, 1465. Mouse lymph node dendritic cells. Gardner, J.K. et al. (2018) Front. Med. (Lausanne) 5, 337. Damen, R. et al. (2013) PLoS ONE 8, e62607.